And it is not Murray River Turtles I have in mind. The risk relates to children like Pippa and her sister Annie who are discovering that the natural world is a playground and a source of furry, feathered and reptilian playmates. Biophilia is an endowment that makes us all potential ‘nature persons’, but that potential is realised only if we experience nature throughout life and especially in the formative years of childhood. For more and more adults as well as children, nurturing experiences of nature are becoming fewer and fewer. The values, aspirations and pressures of modern urban life are distracting us from nature. And with home life becoming increasingly dominated by electronic gadgets and gizmos, biophilia is being eclipsed by ‘videophilia’. This term was coined by Oliver Pergams and Patricia Zaradic and refers to the ‘new human tendency to focus on sedentary activities involving electronic media’. These two biologists report evidence of a ‘fundamental and pervasive shift’ away from nature-based recreation. Their work was done in USA but the story is the same in Australia. They also found that videophilia (along with the price of oil) was likely to be a major reason for this shift. Biophilia is under threat. If we are not careful, it will be buried under layers of cultural “junk” – material and otherwise. The signs that this is happening are obvious and concerning. For example, children’s play has moved indoors. Gone are the days when kids freely took off with their mates to spend unsupervised hours “mucking around” in whatever open and vegetated spaces their homes and neighbourhoods provided. 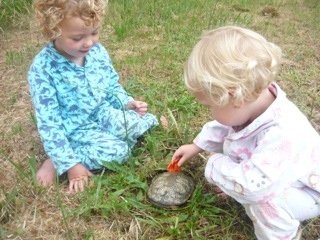 Kids had direct, intimate, happy and life-shaping contacts with nature. It made nature personally relevant as far as recreation was concerned – but not anymore. Adults are also at risk of becoming nature-deprived simply because we live in cities where apartment dwelling is on the increase, green spaces are under threat, working hours are longer and the younger parents among us are surrendering vast slabs of their own leisure time to managing the free time of their children. A common lament is that there is less and less time available for leisure, outdoor or otherwise. Some people are genuinely and unavoidably time poor, but for most of us the problem is not simply lack of time. Our society powerfully influences the choices we make about the time we do have. Being busy, for example, earns social regard and acceptance so we lay it on ourselves to be constantly “on the go”. We live in a market-driven economy. Social standing in such an economy is closely tied to success in the marketplace. This translates to success at accumulating “stuff”. We have reached a point where many of us may have to re-discover nature and its significance for mental and spiritual well-being. We may need to re-think where nature is to figure in our values and priorities, remembering that we will always invest time and effort in safeguarding what really matters to us. Sorry, if this comes across as a bit preachy. But I hope a little bit of earnest advocacy (read preaching if you like) can be forgiven if it encourages people to spend more time with nature, nurturing their biophilia and enjoying its benefits.